British forces raid a Turkish outpost at Maghara and force the Turks to abandon it. 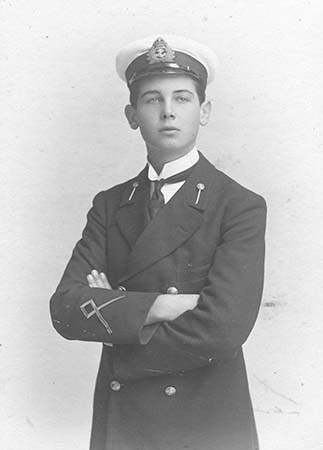 The submarine H3 (Lieutenant George Eric Jenkinson age 27) is sunk in the Gulf of Cattaro when it strikes a mine while attempting to penetrate the defenses. The crew of twenty two is lost. Commanding officer and Sub Lieutenant William Inglis Tatham the son of Lieutenant Colonel the Honorable F S Tatham DSO who is killed at age 19. His brother will be killed in 3 days serving in the South African Infantry. Second Lieutenant Noel Loftus Moore Ward (Essex Regiment) is killed at age 20. He is the son of the Reverend Charles James War Rector of Barnston. Second Lieutenant Herbert Edward Britton (Royal Field Artillery) is killed in action at age 36. He is the son of the Reverend J Willis Britton. Second Lieutenant Samuel Joseph Ebsary (Royal Newfoundland Regiment) is killed in action at age 37. His brother will be killed in September 1918. Private Frederick Foster (Sherwood Foresters) is killed in action at age 22. His brother will be killed in February 1917. Gunner William Robert Monro (New Zealand Field Artillery) is killed at age 22. He is the son of the Reverend G B Monro.